Herman L. "Herm" Wilder, Jr. 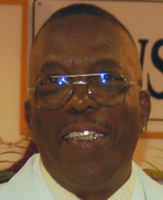 Provide comfort for the family of Herman Wilder, with a meaningful gesture of sympathy. Herman Lee Wilder, Jr. was born on February 17th, 1943 in West Palm Beach, Florida to the Parents of the late Herman Lee Wilder, Sr. and Corine Wilder. He was reared in West Palm Beach, Florida and received his Christian Education from Tabernacle Missionary Baptist Church. He attended school in Palm Beach County and graduated from Roosevelt High School. After High School he became a professional basketball player with the World Renowned Globe Trotters. Being an entrepreneur of a janitorial business for many years, he decided in 2000 to become a machine operator at the Veterans Affairs Hospital in West Palm Beach, Florida. In 2002 he relocated to Stuart, Florida. In 2007 he married Rosa Haston-Wilder and became affiliated with New Mt Zion Missionary Baptist Church in Hobe Sound, Florida. After his retirement in 2010 his new passion was playing pool. He was preceded in death by his father, mother, 2 brothers, Johnny and Paul Wilder; Sister Geraldine White, and a daughter, Joyce Barkley. He leaves to cherish his memory his loving and devoted wife; Rosa Haston-Wilder, sons; Corey Wilder of Miami, Florida, Herman (Shelly) Jordan of Jupiter, Florida, stepsons; Jeffrey (Mary) Epps of Kansas City, Missouri, Alvin (Miriam) Haston of Port St Lucie, Florida and Clarence Roberson of Stuart, Florida, stepdaughters; Jennifer Haston and Lisa (Clarence) Queen both of Stuart, Florida, 2 sisters; Dee (Henry) Brown of Savannah, Georgia and Jeanette Farrell of West Palm Beach, Florida, 1 brother; Stafford Wilder of West Palm Beach, Florida, 2 brother in laws, 6 sister in laws, grandchildren, great grandchildren, a special friend, Willie Mitchell (Mitch) and a host of nieces, nephews, cousins and friends. To send flowers in memory of Herman L. "Herm" Wilder, Jr., please visit our Heartfelt Sympathies Store. Provide comfort for the family of Herman L. "Herm" Wilder, Jr. by sending flowers. Condolences to The Wilder Family. From the Gardner Family / Savannah Georgia With deepest sympathy, our thoughts and prayers are with you during these difficult times. May the family of Herman L. Wilder please accept my sincere condolences hoping you find comfort in God's words at Acts 24:15 and Psalm 37:29.